Recently I was asked if I would like to try some of the newer releases from Dance Legend, and naturally I said yes. They have some really great polishes and I definitely have quite a few to share with you over the next few weeks - starting today. Today I have two of the six polishes from the Step Winter 2019 Collection. LE40 is a clear base with multiple sizes of gold glitter mixed with gold and silver shimmer. The formula of this one is great. It is easy to use and applies evenly. This colour is pretty to wear as a full mani but I think it would also be perfect as an accent nail. For my swatch I used three coats, however you can stop at two coats. I just found that it was a little see through at the tips for my personal taste. LE41 is a fine silver shimmer with multisize silver hexagon glitters in a clear base. I was kinda hoping that this was a little more like LE40, but it is still a really pretty polish. Again, I think that this is good as a full mani and would make for a great accent nail. I did find this one really sheer and would definitely use it over a base colour next time. Formula wise it was easy to use and applied evenly. I used three coats for my swatch, but I do question if I should have done four coats. I think both of these polishes are great and are staples that everyone should have in their collections. Not only do they make for a fun and sparkly full mani but I think that would be great as accent nails. The Step Winter 2019 Collection is available now from Dance Legend. I feel like it has been forever since I have sat down and blogged. These school holidays plus Easter have been really busy for me which means nail time and blogging takes a bit of a back seat. Never fear - tomorrow my daughter is back at school and then we get back into our regular crazy routine instead. Hopefully that means I can get myself back into a more regular blogging schedule. Anyway, I have still managed to swatch my way through a few more of my untrieds which I will share with you today. I was hoping to have a few more but four polishes is better than none. Femme Fatale Cosmetics Dreamers Potion is a mix of moons, stars and diamond glitters in pink, lavender and silver, and a pink/purple shimmer in a clear base. This polish is gorgeous and definitely reminds me of the time when I loved Femme Fatale Cosmetics. You'll be seeing a lot more of their older polishes on my blog throughout this year. Because of the larger glitters in this polish I found it easier to dab the polish on rather than paint it on. For my swatch I used one dabbed coat over China Glaze A Waltz In The Park. OPI Last Friday Night is a sheer blue based glitter with tiny micro glitter and larger iridescent glitters. This polish was released as part of the Katy Perry Collection in 2011. Like with most of my untrieds - I have no idea why it has taken me so long to try this polish. I think I have used all of the other polishes from the Katy Perry Collection. Anyway, I think this is really pretty and really easy to use. For my swatch I used two coats over OPI Rich Girls & Po-Boys. OPI Nothin' Mousie 'Bout It is a light pink base with small iridescent pink glitter and heart glitters. This polish was released as part of the Vintage Minnie Mouse Collection in 2012. I kinda wish that this didn't have the heart glitters in it and that I wore it over a darker pink base. It would look so much prettier. Formula wise this polish is ok. It is quite base heavy though. I used one coat over OPI Pink Ladies Rule The School. Picture Polish Wisteria is a lilac purple creme. 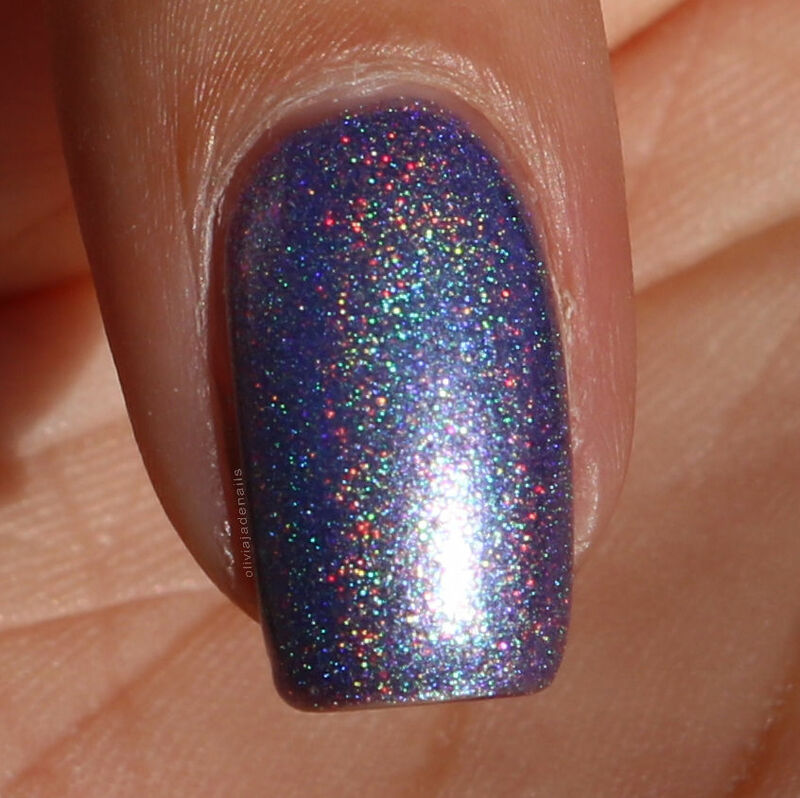 Now I am pretty sure that this is the reborn version of this polish and not the original but I am ok with that. This colour is gorgeous and the formula is amazing! It applies evenly and is opaque in two coats. Right, that brings me to the end of today's post. 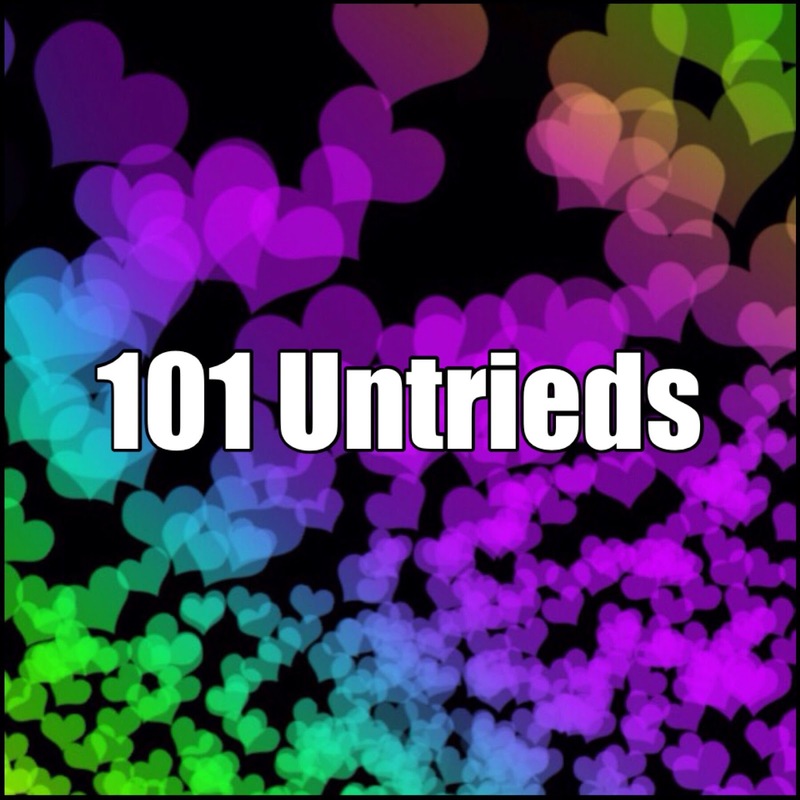 This untrieds post definitely seems to be full of sparkly polishes. What sort of polishes have you been loving lately? Let me know in the comments below. Happy Easter weekend everyone! We are off to an Easter Fair today with some friends of ours so it should be a really fun day and a great start to the Easter long weekend. Recently, I was going through the files on my computer and tidying it up a bit when I stumbled across a couple of manis that I have done at some point with the Uberchic Far East 01 stamping plate. For whatever reason I never got around to posting it on my blog, so I thought why not do it now? It's a great plate and it is still available. Who doesn't love seeing things that were previously released, maybe forgotten about but still available if you don't have it and decide you need it? No, maybe that's just me. Anyway. let's take a look at Uberchic's Far East 01 stamping plate. Let's take a trip all the way back to 2016 when I did this really pretty mani. The image is so beautiful and I love these colours together. For my gradient I used Powder Perfect's Turtledoves and Search The Kingdom and stamped using Emily de Molly's Metallic Purple stamping polish. Funny story about this next mani - it never made it's way to Instagram (until today that is). But I have already posted in on my blog back in 2017 as part of the Digit-al Dozen. For my base I used OPI's Love Is In My Cards and then did one coat of OPI Don't Speak. Fun fact: when I wrote the Digit-al Dozen I commented saying that I have never used any of the 18k gold polishes before and that I should use the others - I still haven't done that. I'll definitely have to get them into one of my untried posts soon. How pretty are the images on this plate? Seeing older plates like this one is definitely making me want to dig through my plate collection and break out some more older plates to play with again. The Far East 01 Stamping Plate is available now from Uberchic Beauty. I'm happy to report that Grace-full Nail Polish are back with another great collection. This collection is called the Shimmer And Shine Collection and consists of eight polishes in total - three holos, one crelly glitter, one metallic flake foil and two flakie crellies. Basically, there is something for everyone in this collection. This collection has polishes named after Mary Poppins songs as they are soft, light and playful and because Theresa had Shim Shimmery, Shim Shimmery, Shim Shim Shimmery stuck in her head when making the polishes....and now we all have that song stuck in our heads too. Thanks Theresa! Right, let's get lost with the pretties that is the Shimmer And Shine Collection. Imagine That is a mint green metallic flake foil with teeny silver metallic flakes. This polish is sooooo shiny and so pretty. It's definitely one of those polishes that doesn't translate well in pictures. It is a million time prettier in person. The formula is great and applies evenly. For my swatch I used two coats. Let's Go Fly A Kite is a soft blue crelly with copper, aqua blue metallic glitter and teal-blue and purple-blue iridescent glitter. I am a big fan of the glitter mix in this polish and the base colour is pretty. The formula is easy to use, however I did find it a little sheer and uneven on the first coat. I used three coats for my swatch. 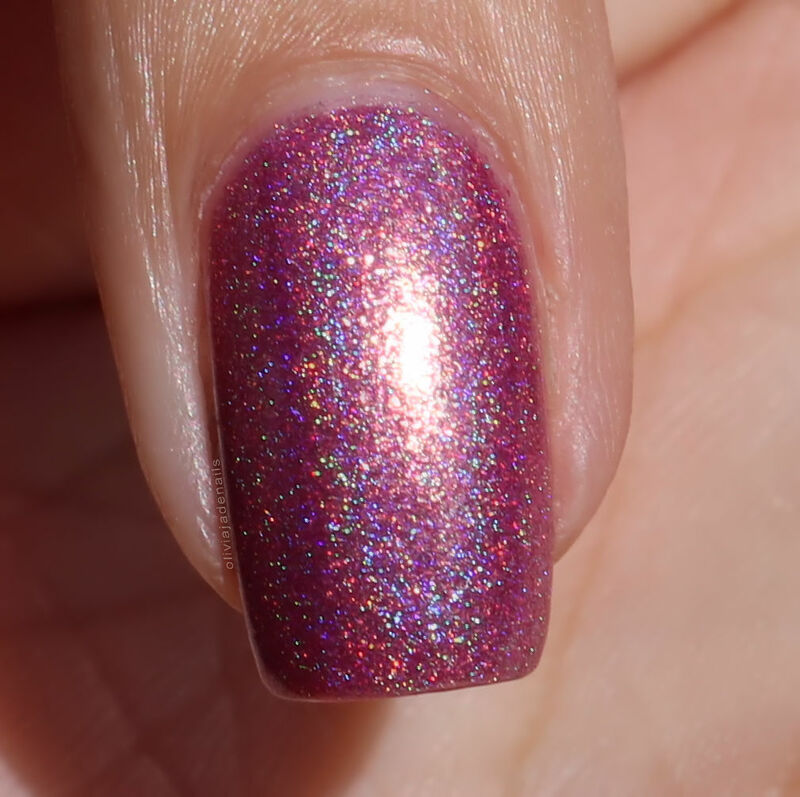 Shim Shim Sher-ee is a tri-thermal that is a soft pink at its warmest moving to mauve then a periwinkle blue at it's coldest and gold shimmer throughout. I love this thermal! I think the colours are gorgeous and the formula is amazing. My swatch shows two coats. 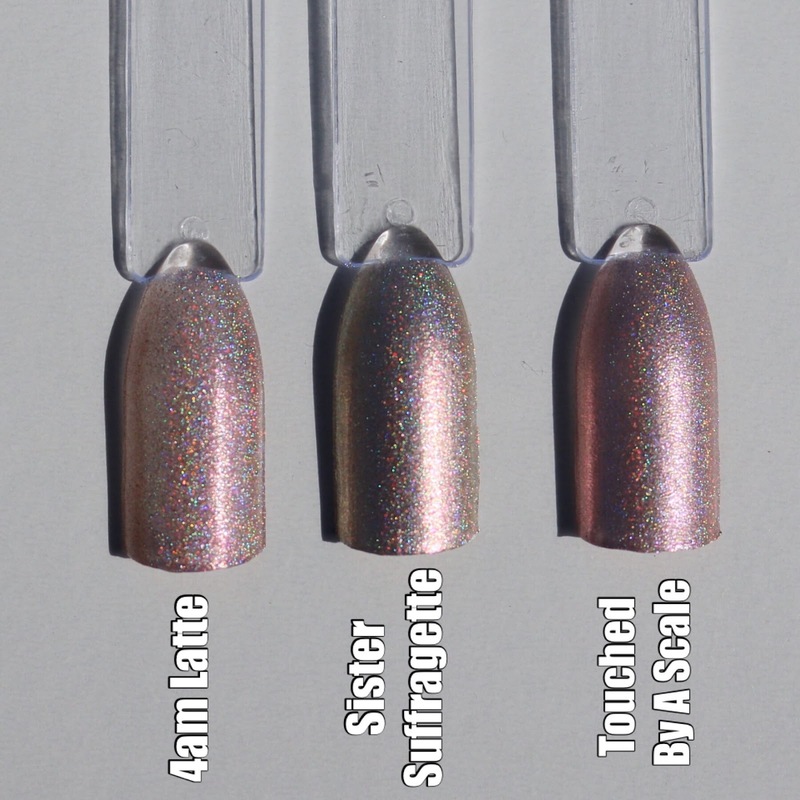 Sister Suffragette is a neutral/gold linear holo packed with red and gold aurora shimmer. If you know me then you know that I love everything with aurora shimmer and this is no exception. It's perfect if you are needing a nice neutral shade with a little something. The formula is great and applies evenly. I used three coats for my swatches because I am super fussy. You really can stop at two coats. Theresa asked me if I could quickly do some comparison pictures between a few of her shades so I thought I would include it in my post. I feel like these look more similar in the pictures than they do in person. They are quite different polishes. I have labelled each of the swatch sticks and each polish shows two coats. 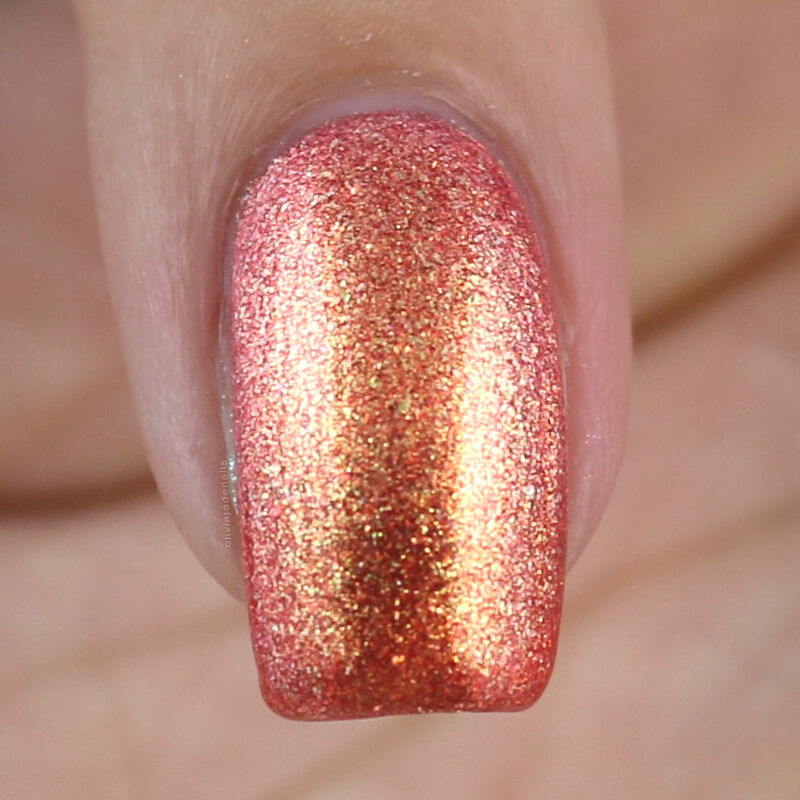 Spoonful Of Sugar is a peachy pink linear holo with gold shimmer throughout. I love everything about this polish. The colour is gorgeous, the shimmer is beautiful and the formula is great and easy to use. I used two coats for my swatch. Step In Time is a light green crelly with gold glitter and gold metallic flakes. I think that this is such a fun polish to wear. I particular love the glitter and flakes in this polish. Formula wise it is easy to work, however I did find it a little patchy on the first coat. It does even out on the second, although I did use three coats for my swatch as I found it a little see through at the tips. 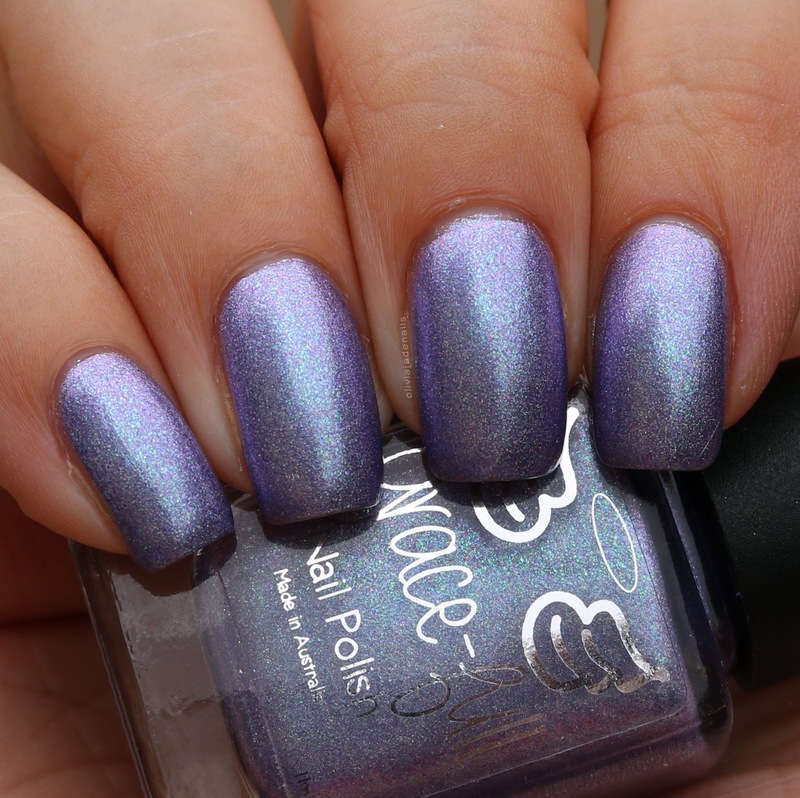 Supercalifrag is an ethereal mauve linear holo with aurora shimmer in blue-purple and teal-blue. I am OBSESSED with this polish! It is absolutely gorgeous! Pictures don't do it justice at all. It is better in person and more shifty. The formula is easy to use and applies evenly. My swatch shows three coats. The Perfect Nanny is a super soft pink crelly with teeny rose gold metallic flakes throughout. I love this polish! It's such a pretty and fresh shade. The formula is great and easy to use. You can stop at two coats but I used three coats for my swatch. I am a big fan of this collection. 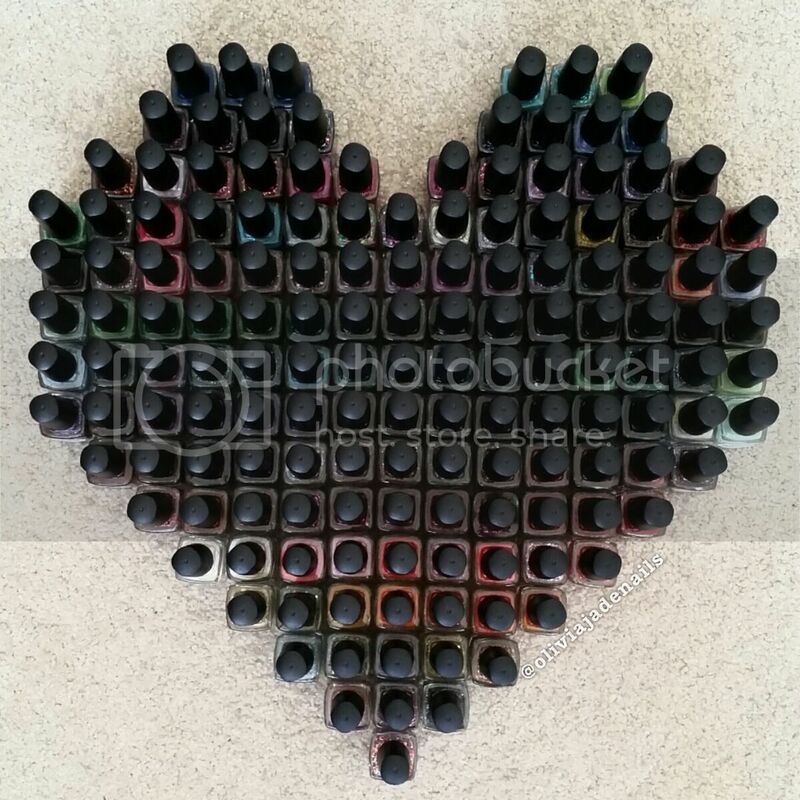 There are so many great polishes in the mix here and definitely something for everyone. My personal picks would have to be Supercalifrag, Shim Shim Sher-ee, Spoonful Of Sugar, The Perfect Nanny, and Sister Suffragette.... did I basically just list the entire collection? Oops. It is a great collection! 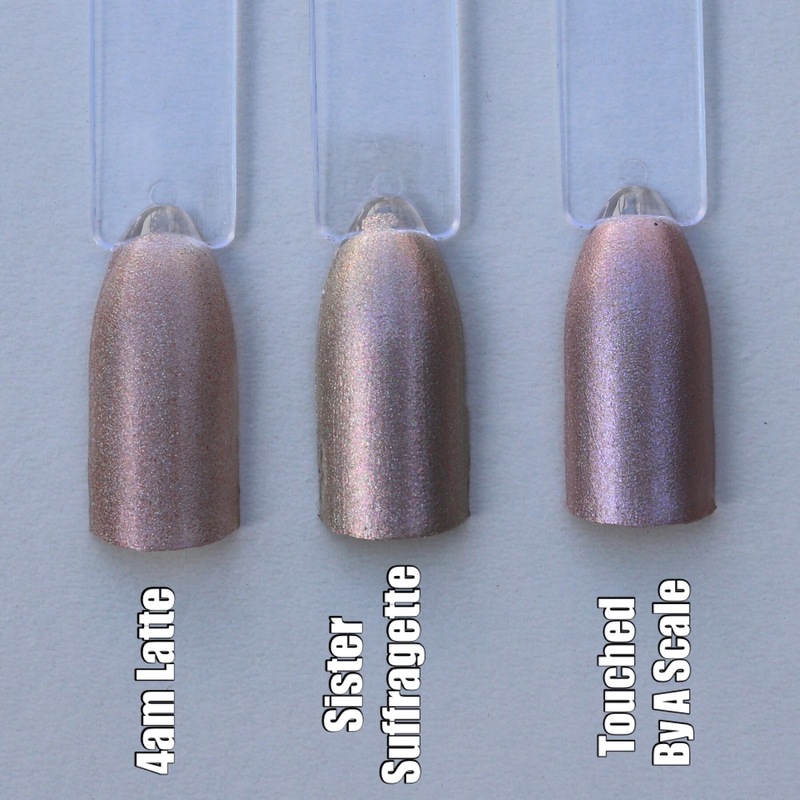 The Shimmer And Shine Collection will be available from Grace-full Nail Polish on 20th April at 8pm AEST (or 5am CST) from the Australian site and the international site.